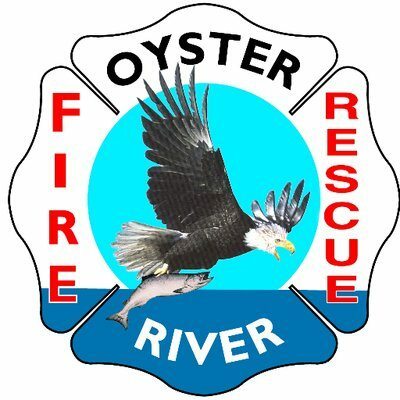 The logo of Oyster River Fire Rescue. 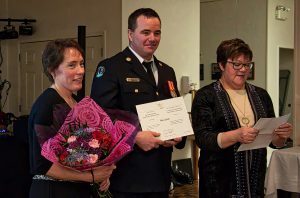 Image sourced from Twitter. 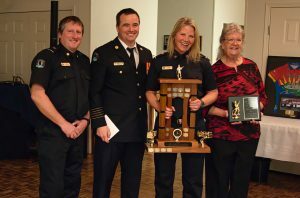 OYSTER RIVER, B.C- Oyster River Fire Rescue held their 2018 Annual Awards Banquet on Jan. 26, 2019. This event honours the members that have completed training and have excelled as firefighters. 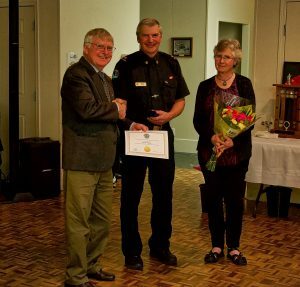 The awards portion of the evening commenced with Fire Chief Bruce Green and firefighter Len Apedaile presenting retired firefighter Jim Doberstein with a thank you gift for his 28 years of service. 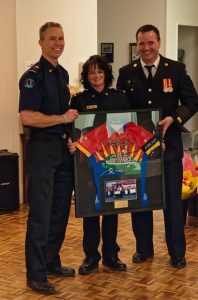 Chief Green and firefighter Ian Emery then presented firefighter Nicole Emery with a framed version of her team jersey as a memento for representing the fire department in the 2018 Tour de Rock. Deputy Chris Murray and Lieutenant/Training Officer Martyn Thomas then presented a Firefighter Level 2 certificate to Tim O’Malley, and Fire Officer 1 certificates to Lieutenants Wil Baum and Kevin Cowie. Comox Valley Regional District Area C Director Edwin Grieve presented firefighter Ross Squire with his 25-year Provincial Long Service Medal. Strathcona Regional District Area D Director, Brenda Leigh was pleased to present Fire Chief Bruce Green with the Federal Exemplary Service Bar for his 30 years of service. 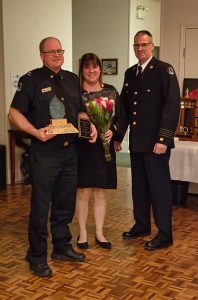 To conclude the awards portion of the evening, Deputy Chief Chris Murray presented firefighter Jason Sorensen with the Rookie of the Year award and Fire Chief Bruce Green and Mrs. Rose Carnie presented firefighter Heidi Fuerste with the Bill Carnie Memorial Firefighter of the Year trophy.